At Duggan Chiropractic, we take great pride in providing the finest chiropractic wellness care to our patients. 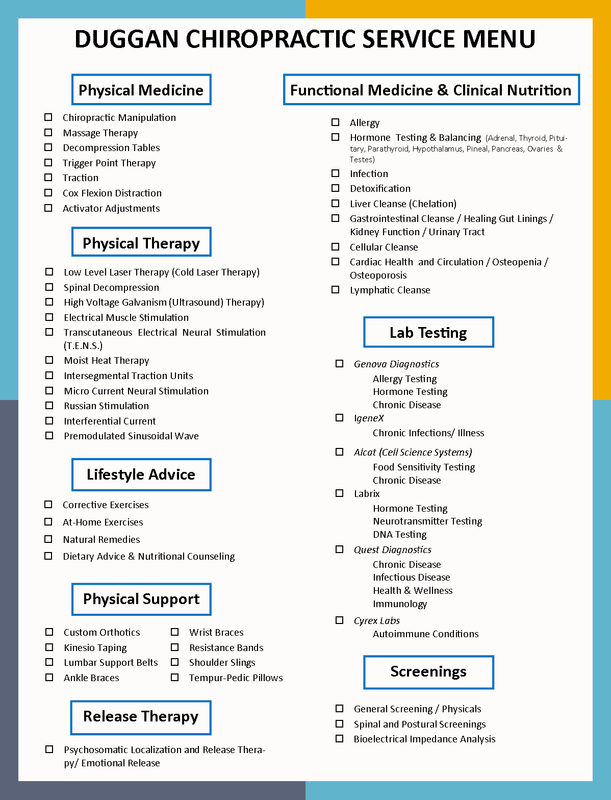 Below is a sampling of the different chiropractic services we offer in our Boulder office. We provide advanced chiropractic spinal and extremity adjusting techniques. Adjustments are utilized to normalize sensory integration pathways. Your nervous system is constantly receiving sensory information from your environment and from within your body. Your body receives all that information through sensory receptors located in your joints, muscles, skin, eyes, ears , nose, etc. If your body is receiving altered information from these receptors due to altered biomechanics, your central nervous system cannot respond to that information correctly. When we adjust your spine and other joints, we help reestablish normal messaging from your sensory system, thus improving the response of your central nervous system to that stimulus. Chiropractic adjustments help create neurological balance, circulatory improvements, muscular balance, normalize biomechanics, and sensory input. Dr. Duggan uses soft tissue massage to help prepare your muscles for a chiropractic manipulation. Soft tissue massage improves blood circulation to the muscles, fascia, and connective tissues to help relax the muscles and alleviate pain. Studies, of the benefits of massage, demonstrate that it is an effective treatment for reducing stress, pain and muscle tension. Trigger point therapy focuses on detecting and releasing myofascial trigger points. Trigger points are described as hyperirritable spots in the skeletal muscle. They are associated with palpable nodules in taut bands of muscle fibers. In many cases, trigger points form as a result of trauma to the muscle fibers. Trigger points are areas within a muscle that cause pain and can refer pain into other parts of the body. Dr. Duggan can perform ischemic compression to help alleviate myofascial trigger points. This technique can isolate posterior facets and discs causing nerve irritation or radiculopathy and improve joint function. Flexion distraction can significantly decrease intradiscal pressure and create dimensional changes in the lumbar intervertebral foramen of the lumbar spine during flexion distraction procedure. Trunk flexion is accompanied by inhibition of the motor neuron pool relaxing local muscles. This technique is especially helpful to alleviate low back and sciatic pain. The activator adjustment method uses a small, hand-held instrument that can deliver a high velocity gentle force to targeted areas of the body. This method can be used as an alternative method to chiropractic manipulations. Applied Kinesiology (AK) is a system that evaluates structural, chemical and mental aspects of health using manual muscle testing combined with other standard methods of diagnosis. The triad of health lists the three basic causes of health problems. 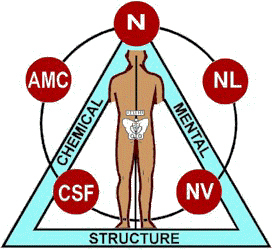 They are structural, chemical, and mental, with structure as the base of the triad. Literally, all health problems, whether functional or pathological, are involved with one part or all parts of the triad. The physician who is aware of the triad of health, and evaluates every patient for all three sides, increases his ability to find the basic underlying cause of a patients health problem. AK skills are developed and approved by the International College of Applied Kinesiology Board of Standards. These skills are refined from many disciplines including Chiropractic, Osteopathy, Medicine, Dentistry, Acupuncture, Biochemistry, Psychology, Homeopathy, and Naturopathy etc. Members of these professions share knowledge through the publications and conferences of the International College of Applied Kinesiology (ICAK). The ultrasound creates high frequency soundwaves that penetrate deeply into the tissues. The sound waves help to increase deep circulation and breakup scar tissue adhesions. Ultrasound is used to decrease pain, enhance blood flow, reduce adhesions, and decrease inflammation. Dr. Duggan commonly combines ultrasound with high voltage galvanic stimulation which also increases in blood flow over an extended period. The utilization of both these modalities together causes accelerated injury healing. The basic mechanisms of the VibroTrac Table are to employ vibration to evoke specific desired systemic responses both neurological and circulatory. The intermittent traction is used to evoke predictable physiological responses on tissues including enhanced bone density, increase in disc space, increase growth hormone production, and rehydrate joints and tissues. The Pneu-Vibe is an intermittent traction table with a built- in vibrational platform. The vibration produces muscle relaxation which prevents spasm and guarding of the affected area. This allows for increased effectiveness of the traction, without increased force of traction. The traction creates a negative pressure, attracting fluid back into the disc. TENS therapy uses low-voltage electric currents to block pain signaling from reaching the brain . Electrodes are used to deliver electrical impulses that travels through the large nerve fibers of the body and block the smaller impulses traveling along pain fibers from reaching the brain. This specific piece of equipment helps to create a gentle, passive motion that causes mild stretching of the spinal vertebrae to improve mobility. The traction table mobilizes the spinal column while gently stretching the muscles and allowing fluid circulation within the vertebral disks. Microcurrent therapy passes alpha wave stimulation through the tissues, which is what the body uses during resting and healing states. MENS therapy helps to increase protein synthesis, stimulate the uptake of amino acids, increase ATP concentration, and helps with pain and recovery. This form of therapy is used to decrease pain and muscle tension. Electrodes are placed around the area of injury and transmit mild electrical impulses that stimulate muscles and release endorphins that act as the body’s natural pain killers. Interferential current therapy is another form of transcutaneous electro muscle stimulation that uses the principle of amplitude modulation to decrease the discomfort at the skin and stimulating deeper muscle tissues. This form of stimulation therapy allows for deep muscle penetration with higher frequencies. It is most commonly used for muscle spasm relief and muscle strengthening. Therapeutic exercises include a variety of activities to restore strength, mobility, endurance, flexibility, balance, stability and range of motion. We teach our patients individualized exercises designed for them to help strengthen and correct their own unique problem. These exercises can be performed in the comfort of your own home and can improve the effectiveness of your overall stability. In addition to skeletal dysfunction, muscles and connective tissues can be imbalanced or strained by trauma, improper connective tissue alignment, scar tissue can form, and over or under development can lead to imbalance. Specific exercises and stretches can help your body stay in balance and improve health. Dr. Duggan will evaluate your diet, exercise programs, relaxation practices, how you respond to stress in your day to day life and make suggestions, when appropriate. He will suggest lifestyle modifications that may be helpful to maximize your health. Our goal is to help every patient achieve a fulfilling life full of the activities they enjoy most. We recognize that each of our patients is a whole person and we help them reach true health and wellness is a collaborative effort. We provide specific individualized nutritive recommendations and healthy food choices to enhance our patients’ wellbeing and help them return to optimal health. Do you know which supplements and vitamins are good for you? Do you know which foods you should be eating to perform at your best? Dr. Duggan can provide a structured nutritional program based on your individual needs. This therapy involves finding where in your body you are storing disruptive emotions and providing you tools to help you release the stored emotions. This technique helps to release restricted energy surrounding that emotion and allow energy to move freely throughout your body, restoring balance to your nervous system. Functional medicine is a biology-based approach to identify and address the root cause of disease. We are all genetically unique and respond to our environment very differently. Functional medicine takes into consideration the interactions between the environment, the body, the mind , and the spirt; and the dynamic balance between them. Dr. Duggan can evaluate each of these components to find the root cause of your symptoms. Duggan Chiropractic offers many modalities that can help identify chemical, environmental and food allergies or sensitivities. We have relationships with many specialty laboratories that allow us to test hundreds of possible antigens. Your hormones play an essential role in your body’s ability to function correctly physically, mentally and emotionally. Hormones effect moods, bone density, collagen production, metabolism, muscle development, gastric motility, immune system and skeletal system health. Through laboratory testing as well as muscle testing, Dr. Duggan can assess your hormone levels and advise you on how to balance your hormones. Your liver is an essential organ in your body that acts as a filtration system, converting toxins into waste products. It is important for your liver to function at its best so it can filter out these toxic substances as efficiently as possible. The three phases of liver detoxification are Functionalization, Conjugation and Elimination. We use nutritional modalities to help enhance the activities of several liver detoxification enzymes and provide antioxidants to support clearance of free radicals produced by Phase I enzymes. In Phase II, large molecules are joined together to produce water-soluble substances that are released to the kidney, or back to the GI tract for elimination that occurs in Phase III. The main function of your lymphatic system is to cleanse toxins and protect your body against them. Your lymphatic system purifies toxins that may enter your bloodstream, preventing illness. Your gastrointestinal system can be involved in many health problems such as arthritis, high blood pressure, inflammation throughout your body, irritable bowel syndrome and heartburn/GERD. There are several toxins that can be found in our air, water and food supply. These toxins can have negative effects throughout your body and can lead to illness and disease. Even though our bodies are equipped to filter out harmful substances, a detoxification program can enhance this natural process. CRA is a system that evaluates the skeletal system, neurological systems, organ systems, endocrine glands, and mental aspects of health using manual muscle testing. The body is controlled by the central nervous system disseminating its’ innate intelligence across the peripheral nervous system. When there is interference anywhere in the nervous system the neurologic transmission is altered and can be monitored at the bodies contact reflex points (circuit breakers). These contact reflex points can be evaluated by creating a circuit, by touching the contact reflex point, and testing through a skeletal muscle to determine if the electrical current traveling through the circuit has been altered. The skeletal muscle will weaken whether there is too much or too little electrical current traveling across the circuit. This phenomenon is like a circuit breaker in your house over-heating and becoming inefficient and causing the lights to flicker. These skills have been refined from many disciplines including Chiropractic, Osteopathy, Medicine, Dentistry, Acupuncture, Biochemistry, Psychology, Homeopathy, and Naturopathy etc. Dr. Duggan can use this health assessment as an insight to any disease risk factors that will help him determine the best protocol for each patient. Kinesio tape helps to facilitate your body’s natural healing process while providing support, stability, and enhanced function to the muscles and joints without causing restriction in your range of motion. Kinesio tape also relieves pressure on the pain receptors located directly under the skin, allows lymphatic flow, and reduces local inflammation . It can also facilitate lymphatic drainage by lifting the skin. The taped portion forms convolutions in the skin, thus increasing interstitial space. The result is that pressure and irritation are taken off the neural/sensory receptors. Then, slowly, pressure is taken off the lymphatic system, allowing it to drain more freely. Duggan Chiropractic offers custom-fit orthotic services through Foot Levelers. Having proper alignment starts at your feet. Orthotic inserts can help improve the biomechanics of your ankles, knees, hips and low back. Scientifically proven to improve balance, reduce pain, enhance performance, improve strength, even helps golfers hit balls 9-12 yards further. We specialize in treating patients that have been injured in automobile accidents and are seeking conservative care methods in treating their injuries. Dr. Duggan has experience treating accident victims for over thirty years, and has created an extensive network of physicians, physical therapist, neurological testing centers, acupuncturist, psychotherapist, imaging centers, neuropsychologist etc. This multidisciplinary approach assures that you will receive the care that you need to attain a pre-injury status whenever possible. The Pneu-Vibe is an intermittent traction table with a built in vibrational platform. The vibration produces muscle relaxation which prevents splinting and guarding of the affected area. This allows for increased effectiveness of the traction, without increased force of traction. The traction creates a negative pressure, attracting water back into the disc. The combined effects of the Pneu-Vibe, our nutrition and laser protocols, and therapeutic exercises create a unique combination of care to speed up healing and increase strength and flexibility. The studies done by Pneumex have so far been overwhelmingly positive. In addition to these benefits, the MRIs of 7 out of 8 patients in a 30-visit pilot study showed an average increase of 18%- 38% in hydration levels of the affected intervertebral disc(s). All 8 patients reported they were PAIN FREE at the end of the study. (All had long term chronic conditions.) All three of the patients who volunteered for the post MRI showed a 100% reduction in disc bulge and a significant increase in dehydration. Note: (Before) The dark colored L5-S1 Disc indicates that it is dehydrated. It should be more white like the one above it. Also note the bulge sticking out into the white space that is the spinal cord. This pressure on the spinal cord can create radiation of pain and symptoms in the lower extremities, as well as possible weakness in the musculature from blocked nerve pathways. Note: (After) Notice that the disc color is lighter, indicating rehydration of the disc. The bulge has also receded, relieving the pressure on the spinal cord, relieving pain and restoring function to the areas supplied by the nerves involved.